"I'd like to thank you and your colleagues for all of your help and great suggestions. 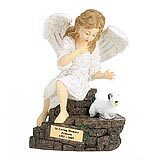 I just received my Angel Ashes Library Edition Memorial Urn today. It is exactly what I expected. All of the writing is accurate and beautifully done. The urn has a lovely classic look to it. It will definitely help my husband and me to memorialize our Bobby, who had a great long and happy life with us. The urn will be on display in our living room next to a photo of Bobby as a young "man" of one year of age. Thank You very much for your kind, generous and thoughtful service. " 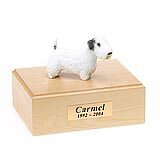 All available Sealyham Terrier dog urns and memorials will be displayed with the figurine on the Sealyham Terrier urn you select and in the appropriate size.